The United States Mint began selling bags and rolls of Vicksburg National Military Park Quarters at noon Eastern Time Monday, August 29. The reverse design featured on the quarter honors the national military park located in the state of Mississippi. "The coins in the bags and rolls were struck on the main production floors of the United States Mint facilities at Denver and Philadelphia for use in general circulation but have never been released into circulation," the United States Mint described in a press statement. The Vicksburg National Military Park Quarter two-roll set priced at $39.95, which is the same price as the previous two-roll sets in 2011. The two rolls include 40 coins minted in Philadelphia and 40 coins produced in Denver — the same locations responsible for producing all of the circulating coins for America. 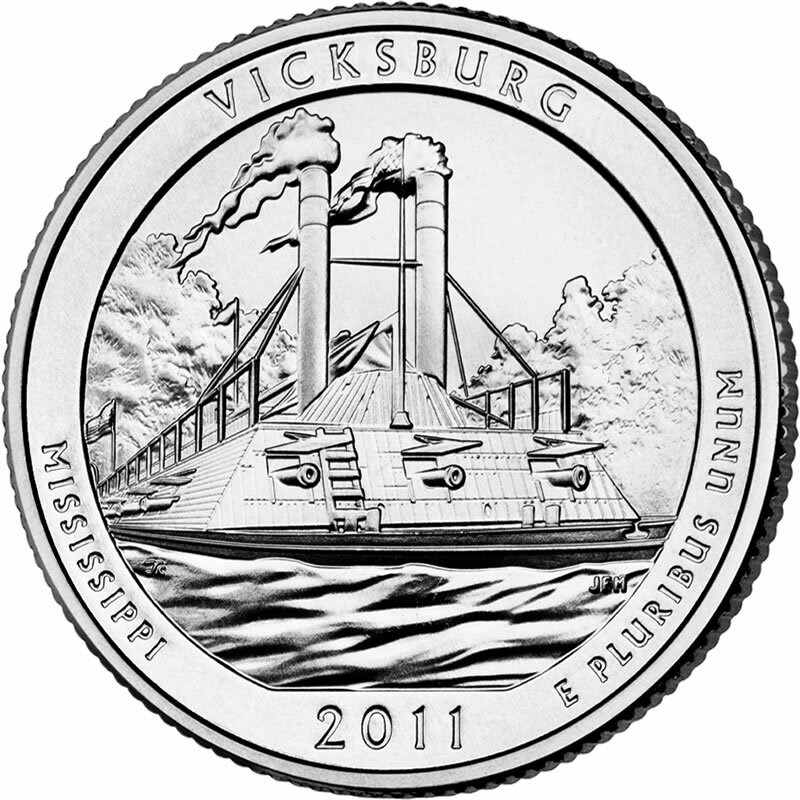 "The special numismatic packaging displays the name "Vicksburg National Military Park," the abbreviation "MS" for Mississippi, "$10," the value of its contents, and "P" or "D" for the mint of origin," the Mint’s statement further described. Vicksburg National Military Park Quarter bags cost $49.95, which is also the same price as previous bags that have been released in 2011. Available options include bags with 100 coins from either Philadelphia or Denver. The United States Mint canvas bags are tagged with the name of the military park, "MS" and "P" or "D". Children 18 years of age or younger will receive one of the new coins for free while adults, after the ceremony, can exchange their cash for up to ten rolls. A free United States Mint public coin forum will be held Monday evening at 7 p.m. CT at the Vicksburg National Military Park in the Visitor Center Auditorium which is located on 3201 Clay Street. Coin forums offer an opportunity to express views and ask United States Mint officials about past and upcoming coin programs. Designed by Thomas Cleveland and sculpted by Joseph Menna, Vicksburg quarters features an image of the U.S.S. Cairo on the Yazoo River. The scene is as the Cairo would have appeared when it served the Union Navy during the Civil War. Inscriptions include VICKSBURG, MISSISSIPPI, 2011 and E PLURIBUS UNUM. The obverse or heads side is the same as the previous eight America the Beautiful Quarters. It features the portrait of George Washington by John Flanagan. Inscriptions include UNITED STATES OF AMERICA, LIBERTY, IN GOD WE TRUST and QUARTER DOLLAR. Two unique products that feature the same designs as the quarter-dollar include a bullion coin and a collector coin which have a diameter of three inches and are composed of five ounces of .999 fine silver. 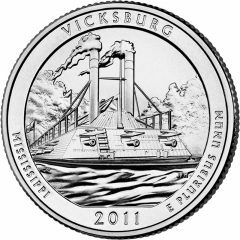 Intended for investors, the Vicksburg 5oz Silver Bullion Coin was released June 20. The Mint has not yet indicated when it will release the collector Vicksburg 5 oz Silver Uncirculated Coin, but it is expected out later this year or early next. 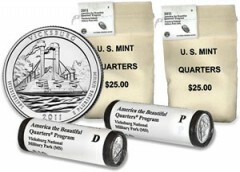 The bags, rolls and related products may be purchased from the United States Mint website at http://www.usmint.gov/ or by calling the bureau’s toll free number 1-800-USA-MINT (872-6468). The last America the Beautiful Quarter for this year honors Chickasaw National Recreation Area located in the state of Oklahoma. The first 2011 Gettysburg quarter was made available on January 27 in bags and rolls. It celebrates Gettysburg National Military Park located in Pennsylvania. The second 2011 Glacier quarter was released in bags and rolls on April 4 and honors Glacier National Park located in the state of Montana. The third coin celebrates Olympic National Park in Washington. It was made available in bags and rolls on June 13. For more information about the Vicksburg National Military Park, visit the National Park Service site for it located at http://www.nps.gov/vick/. I have a Vicksburg quarter that the ship side is off center, wide on the top and very thin by the date, is it common or worth anything?